What Are The Hottest Yard Sale Items? What Sells Best? First, I’ll share with you what I, personally, have experienced in terms of what sells and what doesn’t at yard sales. Then, we’ll see how my list compares with what “the experts” say. I’ve found that guys tend to gravitate toward tools, movies, sports stuff, CDs & DVDs, office equipment, computer stuff, and yard items. Some of the more unusual things that ladies will scoop up are: unused (or slightly used) health & beauty products, crafty stuff, kids books & toys. 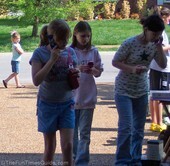 Teenagers like old cell phones (I sold 5 of ’em for $1 to $3 apiece). And you may be able to get another 50 cents for each “attachment” (AC charger, headset, car charger, belt clip, etc.) but I usually just include those in the price. Larger, higher-quality items definitely bring crowds to your yard sale. Especially sofas and other pieces of furniture, as well as used lawn care items like mowers, trimmers, and leftover home building & repair items (bricks, stonework, old chandeliers & light fixtures). 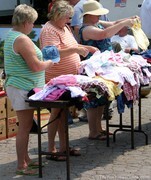 Items for kids, toddlers & babies are also big sellers! As are pregnancy-related items, new baby things, and wedding stuff. Magazines (even for 25 cents apiece, even for recent issues) don’t sell well at all. These are best donated to a nursing home, hospital, or doctor’s office. Or, recycle ’em and pass them onto friends or Freecyclers! Regional items (from other regions) don’t usually do well at yard sales. For example, I’ve been searching for “that needle in the haystack” for years now — waiting patiently for an Indiana University grad to buy up all of my old IU alumni memorabilia. They’re few & far between here in Tennessee! Same with some excellent Florida travel guides that are worth a pretty penny. Few people around here are planning trips to Florida in the coming months. Much like with other collectibles, it takes that one special person to find value in such an item. Clothes… unless you’re willing to sell items of clothing for as little as 50 cents apiece, don’t even bother. Your clothes may be worth much more than that, but let’s face it, if they don’t sell, you’re probably just going to donate ’em (for FREE) to a local charity, right? You can find clothes for a dime a dozen at yard sales, and sometimes in better shape at places like Goodwill & Salvation Army stores. Few people are actually looking for clothes at yard sales. The sooner you come to grips with that, the better. That’s why your best bet, if you really want to move some clothes is to price all clothing at rock-bottom prices. Period. The Hottest Yard Sale Items Are Actually Shade & Shelter! Shade is a hot commodity at most yard sales — especially after Noon! Most of your visitors have been going from yard sale to yard sale, so anyone who arrives at your garage sale in the afternoon hours is likely to be hot, tired, and thirsty! If there’s any way to move some of your items into the shade, those items will be looked at longer. Just the same, know that people will tend to congregate inside your garage (if there’s enough room) — just to get out of the hot sun for a few minutes! Also… should it start to rain (especially if it’s a sudden downpour!) 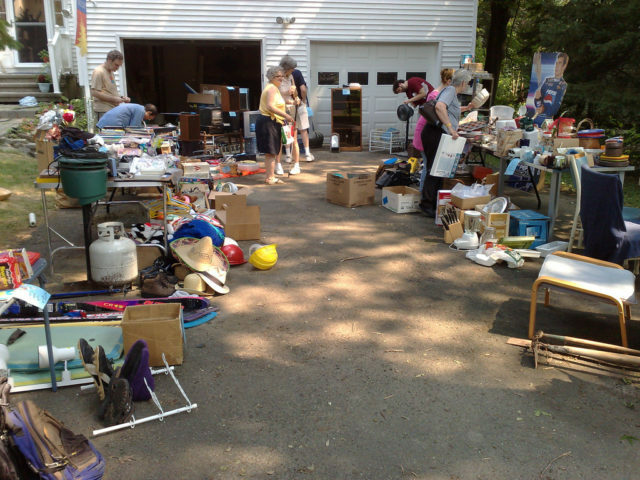 during your yard sale, you can bet people will try to cram into your garage, seeking shelter from the rain. And if you have a porch, they’ll hang out there too. And kids will even duck under your tables — just to avoid getting wet. This is yet another reason, why it’s a good idea to have snacks & water for sale… many appreciate having a way to pass the time. And the “freebies” become very popular during this time, as well.